There's no better way to improve at chess than to play lots and lots of games. Unfortunately, we don't have an online play feature here at Chess Strategy Online, but there are plenty of servers out there where you can find opponents of all levels, day and night. Here on this page are links to the best of them. ICC is pretty much the premier chess playing site. If you want to play against grandmasters and other titled players, ICC is the place to go, because more top players play here than any other site. If you're looking for strong opposition, ICC is the best hands down. Membership is not free, but there is a one month free trial period. With over 11 million members, chess.com is probably the best place on the internet to play for free. You can play both live chess at various time controls, or correspondence-style games with days per move. Basic membership is free, but VIP users gain access to extra training features, videos, and statistics. Another large site with over 1.4 million members, ChessCube stages hundreds of tournaments each day where players can win cubits, the site's online currency, which can then be spent in the ChessCube shop. Signup is free, with VIP membership for paying customers. Free membership can be extended by betting cubits and winning games. Lichess is notable for being a free and open source online chess server. You can even embed it in your own website. It provides a variety of online play modes, as well as training features, and the competition is decent. A number of titled players play there, and you can even earn the LM (Lichess Master) title, which appears by your username. FICS is one of the oldest online chess servers. It was originally set up as a free alternative to ICC when ICC started charging players for membership. As there is no official interface, in order to play you need to download a compatible interface. 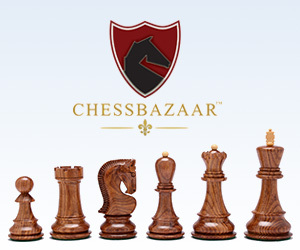 Playchess.com is run by ChessBase, the makers of the most popular chess database software. There are fewer strong players than on ICC, but the site is fully integrated with the ChessBase software and other ChessBase programs such as Fritz. GameKnot is one of the larger correspondence-only sites, with over a million members, and is free to play. The interface is pleasant and there are other features such as a game databaase, tactics training, and annotated games. Another correspondence-only site with a large player base, Red Hot Pawn has tournaments and ladders, as well as teams (called 'clans' on the site) and other play modes. Basic membership is free, with a subscription for advanced features. Chessworld.net is a popular online correspondence chess site, founded by popular online chess vlogger Tryfon Gavriel, aka Kingscrusher. Basic membership is free, but there are a host of extra features available to paying members. A much more basic option than the others, and better for casual players than those in search of serious competition, ItsYourTurn.com provides simple correspondence-style play without any bells or whistles. The great advantage of this site is the large number of other games you can play in addition - from Xiangqi and Go to Backgammon and Battleships!